Excited to move, but have a limited budget and dread the back-breaking work of carrying heavy boxes and furniture out of your old place and into your new home? Do the best you can to save money by getting free boxes from retail stores, packing your worldly possessions yourself and renting a UHaul and driving it to your destination. That’s all good. But set a few bucks aside and hire one set of local moving people to carry all the boxes, beds, furniture and heavy stuff out of your current dwelling — and a second set to meet you at your new place and carry the same things into your new place. You can do this easily via the UHaul website. 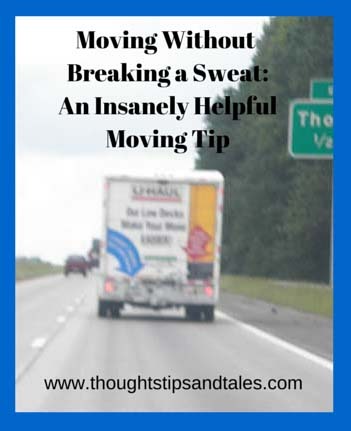 You save yourself untold sweat and strain with this helpful moving tip. Two professional movers can unload a full-sized UHaul trailer and carry everything inside in a few hours. $400-$800 total at $25-$100 an hour (plus tips) for movers on both ends is money extremely well spent. 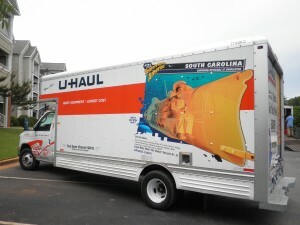 My son and daughter-in-law rented a U-Haul when they moved to another state and hired movers on both ends through the website at http://www.uhaul.com/MovingHelp/. Movers are given unedited ratings by customers, so you can pick ones with the highest reviews, which they did. Two young men came to their apartment on time and ready to work — and carefully loaded everything, including heavy couches, tables and a china cabinet, as well as a king-sized bed, into the full-sized rental van in about three hours. 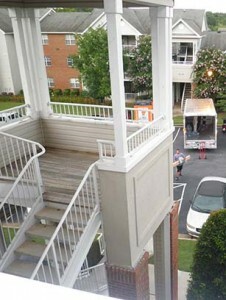 We drove the cars and the van to their destination, where we met another set of movers at the new apartment. These two energetic men emptied the fully loaded rental truck and carried everything up three full flights of stairs (43 steps each way — no elevator) into their third-floor apartment, in less than four hours. In the horrible, humid heat of August. We couldn’t believe how easy it was. All we did was give them some cold drinks and stand in the air conditioning to direct them to the rooms where the items belonged. My son and daughter-in-law moved for a second time recently in the same town, and they hired local movers again through the same website to move out of the third-floor apartment and into a first floor house. It worked out just as well as the first time (only the movers were taking things down three flights of stairs). Nothing got broken, and nobody got hurt. Now that’s a smooth move. This entry was posted in moving, uhaul and tagged moving, uhaul. Bookmark the permalink. That is a great idea, if you have a budget for even that much expense for a move. Thanks. Really nice idea! Thumbs up for the post! Greets, Man With Van Holland Park Ltd.
Thumbs up for your tips! I read so many posts about moving ideas, and this one one of the best so far. When the time comes to moving like it’s going to in a couple of weeks, my wife and I receive tips about how to make a quick move. Together we find a moving company that has a large truck that’s big enough to store all of our furniture and appliances instead of having to make 2 trips we intend to make it one single trip. It’s a tip that a friend of ours gave to us as well as to always plan ahead and leave room for the workers to move around. I love that I can go to the grocery store and ask if they have spare cardboard boxes that I can use. The trick is to ask several stores and give them each a number that is low enough so that they are willing to part with the boxes. I just don’t like the idea of spending a lot of money when I am moving. Designate a color for each room in the new home, such as yellow for kitchen, orange for dining room, etc. Apply colored stickers on the box near the box number. In your new home. Put a matching sticker on the door to each room. Thanks for sharing the experience your family had with hiring movers to do the actual labor! I have never done that, and am getting tired of hauling boxes up and down stairs every year or two. I’ve always thought it would be way too expensive to hire help, but after reading this, I think it actually might be pretty doable! I am gong to be moving soon, and I want to make sure it as stress-free as possible. That being said, I noticed you talked about making sure I hire movers before I do anything. After reading why I should do this, it makes perfect sense as to why it would help me out. I’ll make sure I start looking for some help right away. Thank you so much for sharing this information with me. Excellent tip. Another one I like is to pack all your essential items in an oddly shaped, differently colored box. When you arrive at your new location, this box should be extremely easy to locate. Thanks for sharing! Last time I moved, my husband and I did most of the work (though we did have some other people who volunteered to help). We thought we wanted to save money, but with two little kids running around and adding to the stress, I kind of wish we had hired someone to help. Having someone else to help empty out the moving truck, and getting that done in a matter of hours without any mishaps, sounds absolutely amazing. If we ever move again, I will definitely be considering hiring some people to help. It’s great that you found such a successful resource for finding equipped professionals who do not disappoint. You’re certainly on a lucky streak. Yes, the Uhaul`s Moving Helper marketplace is indeed of great help. I`ve used their services. I totally recommend it! The part where you mentioned the guys who moved everything up 3 flights of stairs gave me flashbacks to when I moved into my first apartment after college. I think when I moved out of there, I actually sold the majority of my furniture to the people who took over my lease because I didn’t want to take it back down the stairs. I don’t think I’d ever go back to moving my things on my own again. The fact that I can get movers to do this for me is more than worth it. Tips for moving service guys are insanely important. If your family moves rather often, you better be generous so that you gain trust of these people. Next time you hire them you’ll learn how important it is being polite and grateful for their job.